I happened to stumble across a report from the Pew Research Center on the demographics of happiness. The report was interesting, but very little was actually surprising. The report finds that income corelates to happiness, as having one's basic needs met can remove some of the most common causes of misery. However, the survey puts all making above $150,000 a year into one bucket, thereby not providing any insight into whether there is incremental probability of happiness upon making $300,000, $500,000, or $1 Million a year. I believe that it is quite possible that there is virtually no marginal increase in happiness beyond an income of, say, $200,000 a year or so, because nearly all material needs are met at this threshold. Additional income can bring only more power, prestige, and fame, but material consumption and the resultant gratification saturates as this point. In other words, if someone making over $200,000 a year is still not happy, it is probably for some reason other than money. The next question that arises is that of relative vs. absolute wealth. If a person earns more than 95% of the members of his society, he is rich in whatever era he lives in, but even a person of average income today has many technological luxuries that were unavailable to the wealthiest person 50 years ago. This, combined with the rapidly growing ranks of the wealthy as a share of the total population and the tendency of prosperity to move people up the ranks of Maslow's Hierarchy of Needs, could lead to a very slow but steady migration of happiness away from increasingly accessible material consumption and towards more self-actualized forms of human fulfillment. Beyond wealth, one's worldview has an influence on happiness. When happiness is categorized by political leanings, Republicans have had a stark advantage over Democrats for the last 35 years. This is even during the Clinton years, when Democrats had the most reasons to be cheerful than at any other time, and President Clinton himself had a contagious optimism that contributed towards high consumer confidence and a strong economy. The most obvious explanation for why 'liberals' are perpetually unhappy is that the realities of the real world continue to deliver outcomes contrary to what theoretical 'liberal' beliefs lead them to expect. Additionally, one particular strain of 'liberalism' departed from the genuinely liberal goal of improving society, and mutated into a religion of hatred towards those who are happier than they are. 'Tax the Rich' might really be intended to mean 'Tax the Happy, because we are jealous of them'. There was a time when the 'left' and 'right' merely disagreed on which approach was more suitable to cause improvements in society, as opposed to today when many on the 'left' have no interest in improving society at all, but merely feign altruism while engaging in a hateful campaign to obstruct or distort the pillars of traditional society from which most non-leftists derive happiness (such as marriage, faith, children, or entrepreneurship). This causes great conflict between their leftist religion and the natural urge of human decency still faintly present within them, and thus leaves them twisted and tortured in self-contradicting misery. The same is probably true of suicide bombers, for that matter. Since happiness is a natural condition, present when natural needs are met, what does it tell us about which belief systems, activities, and behaviours are more 'naturally' suitable for human life? I love your great statistical analysis and articles, but you really should do something about the html in your blog header. Happiness is good. It is good to be happy. Happiness like beauty is in the eye of the beholder. Many quadrapeligics find happiness. Many poor across the world are happy. Clerics who take vows of poverty can be happy. Maslow is wrong. Having an income of less than $150,000 does not condemn one to unhappiness. Of course. 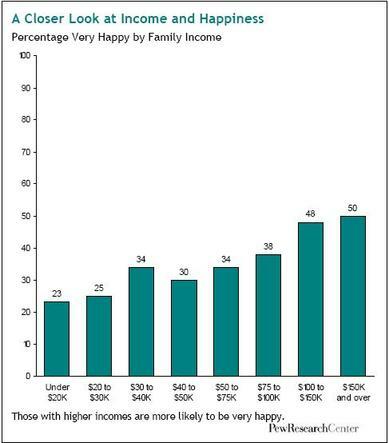 The chart itself shows that people with low incomes are also happy in 25% of the instances. But happiness rises with income, until a certain point, where more income no longer increases the chances of happiness. Clerics are actually self-actualized in many cases, so are already at the top of Maslow's hierarchy of needs. In 2004, the researchers developed a survey tool that measures people's quality of daily lives. Then they asked 909 employed women to record the previous day's activities and their feelings toward them. The richer you are the greater your chances are to be happy. Not a massively shocking discovery. What interests me is the middle-class dip. The $40,000 to $50,000 range shows a drop in happiness. Why? As for the Republican/Democrat split, be careful in interpreting cause and effect. The "happiness gap" could be because Republicans tend to be richer. It could also be (snark warning) nothing more than the fact that the sight of rich, arrogant, jolly Republicans is just so damn exasperating. Keep Maslow out. The theory looks intuitvely likely, but it doesn't seem to hold up under scrutiny. I would also contest the idea that happiness is a natural condition. I don't think that's the default position of humans in the absense of stressors or discomfort. Evolutionary psychology would suggest that mild anxiety would be a more likely default position. Happy, jolly people get eaten. You didn't read the Pew Report. Within, it shows that even at low income levels, Republicans are happier than Democrats of the same income. This is true of ALL tiers of income - whether $20K, $30k, $40k, etc. the Republican is happier than a Democrat earning the same income. 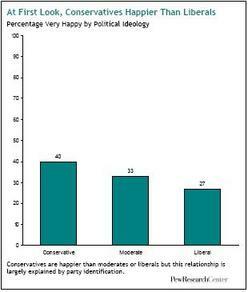 Even within Democrats, moderates are happier than liberals. This would concur with the pattern of one *needing* to be a pessimist in order to be a Democrat. The Independent Women’s Inst. published an interesting set of charts on, among other things, happiness by year, country, family type, etc. http://www.iwf.org/pdf/American%20%20Promise.pdf”>(PDF file)The most interesting chart shows that happiness is constant from 1979 to 2005, despite inarguably increased standard of living. I think this shows happiness is determined much more by what you are/do vice what you have. 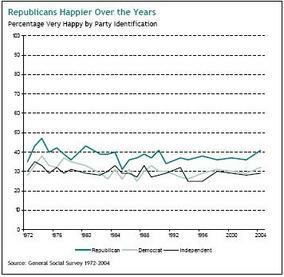 It also gives supporting reasons as to why Republicans are happier than Democrats. Half of your personality is inherited. Identical twin studies prove it. Happiness may be written in your genes. Interesting point. That means that political leanings may also be inherited in the majority of cases. If abortion has aborted 45 million people since 1971, of which a cumulative 15-20 million would be of voting age today, and 70%+ of them would vote Democrat, then the pro-abortion people may just have eliminated millions of potential voters from being born. Abortion is the biggest form of birth control in Russia. While the saying “you can’t buy happiness” may be absolutely accurate, it certainly doesn’t hurt your overall happiness if you aren’t worried about where your next meal is coming from. Random useless anecdote time: I worked through college, with some help in the form of financial aid and a bit of help from my parents. But there were times, near the end of the semester, when things would get lean. “time to buy noodles for the next month” lean. It was stressful worrying about if I would be able to work enough to pay bills, buy food, And somehow have enough time to attended lectures. Now that I’m well out of college, married, kids, standard American Dream fodder, that stress about the next paycheck doesn’t exist. Am I happier now? I have no idea. But I have significantly fewer day to day worries. So perhaps that is the correlation. Not absolute income, but rather how wealth and income potential alleviate the need to focus on day-to-day survival which translates into a general wellbeing. Or not. I certainly have no idea. But even my worst days are less stressful than every day back then. Be careful making jumps of correlation to causation. You are assuming that liberals have a lower happiness level than conservatives BECAUSE they liberal. While that conclusion supports your notion that liberals hold the views you project onto them, it's simply not backed by the data at all. There is a rather high correlation between drowning deaths and the amount of pavement tar that melts in a given city in a given time period. The more tar the melts, the more drowning deaths. That doesn't mean that melting tar makes people drown or that people drowning melts tar. More likely it means that there is a 3rd and seperate factor effecting both variables (in this case, heat). When you're discussing something more general like this it becomes increasingly likely that there are MANY other factors effecting both variables. You're own link indicates that black people are less happy than white (which is also a correlation, NOT a causation). Black people also tend to vote democratic (another correlation, NOT a causation). Therefore even if you controlled for everything but race, you'd find that Republicans report a generally higher level of happiness. Yet this poll controls for NOTHING. You cannot draw any usable conclusions from it. I didn't save any cites, but I've seen articles suggesting happiness is correlated with your income RELATIVE to that of your same-cohort peers. In other words, if you're young and broke and just starting out, you're okay with that, because your friends are in the same boat. If you're earning a lot more than your peers, you're likely to be happier than they are. If you're middle aged and broke, like I am, you're likely to be downright miserable. This started as an interesting article, linked in with my interest in the relationship between political leaning and happiness. Then you lost it, big time. To suggest that those who support taxing the rich are simply jealous is outrageous and, I suspect, a thinly veiled attempt to slur those who believe a a fairer and more equal society. Did it not occur, through your web of right-wing lunacy, that Republicans are happier then Democrats and liberals because the latter take more interest in the inequality that is prevalent in western society? If you take a look at the relevant psychological research, you may find my argument supported. The relevant psychological research supports my points, and disproves yours. America already IS the fairest and most equal society in the world. Before you trot out the 'Sweden' example, note that Sweden doesn't let in immigrants the way America does. The 'inequality' you claim to loathe is the natural order of things. People do not have equal abilities, hence will not receive equal outcomes. Exactly how will you legislate that a hard-working person make the same money as a lazy person? Or that an ugly woman get the same level of male interest as Miss California? It is not 'right-wing lunacy', it is common sense. It is you who live in fairy-tale world that most people grow out of by age 8. Your ranting prove the point of the article beautifully.